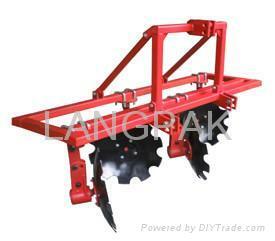 the ridger is used for making ridge in the field after tillage. The main frame is made of rectangular tube welded together, assembled with the angle adjustable disc ridging unit. The discs are made of qualified 65Mn steel plate with heat treatment. The machine is steadydurable, convenient for transporteasy to adjust, operatemaintenance.